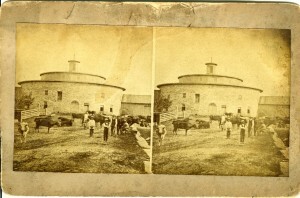 A stereoview of the Round Stone Barn taken after 1883 when reconstruction of the building was completed. 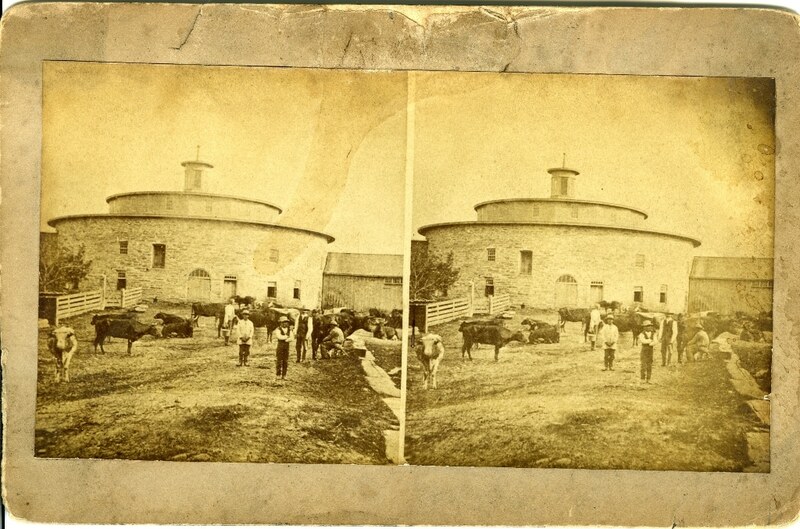 The Round Stone Barn is the only circular barn ever built by the Shakers. Widely recognized as an architectural icon and agricultural wonder, this unique dairy barn originally stabled 52 milk cows. It’s been attracting visitors – most notably Nathaniel Hawthorne and Herman Melville, who staged a footrace in the structure – since its construction. The Round Stone Barn offers ground-level access on all three levels. Wagons entered on the upper level to deposit hay into the central haymow on the main floor below. The Brethren would drive the empty wagons around the circular barn floor and exit the same door they came in, eliminating the potentially dangerous activity of backing wagons out of a barn. The cows stabled on the main floor faced inward toward the haymow for ease of feeding. Manure shoveled through trapdoors to the cellar was stored until needed as fertilizer in the gardens. The Shakers maintained a working dairy farm at Hancock into the 1950s. When you visit the Round Stone Barn today, you will learn about the Shakers’ progressive agricultural practices as well as the construction and history of the structure. The museum’s working farm program houses animals in the Dairy Ell which extends off of the Round Stone Barn, and the round portion of the barn is filled with heritage breeds of lambs, piglets and calves during the Village’s annual Baby Animals on the Shaker Farm celebration each spring.